Dianne M. Boland, a Legionnaire from Post 117 in Palm Bay, Florida, was elected Department Commander on July 7, 2018 in Orlando, FL, during the 100th Department Convention. Commander Boland is a twenty-four year continuous member. 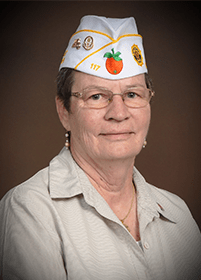 She is the first woman to be elected to the top position of The American Legion, Department of Florida. Commander Dianne (Davidson) Boland was born in Springfield, MA and graduated from Lordstown High School in Lordstown, OH. Commander Boland entered the United States Air Force in 1965, completing basic training at Lackland Air Force Base, Texas. She served on active-duty as an Accounting and Disbursement Specialist until her honorable discharge in 1968. She served active in the reserves as Air Cargo Specialist from 1978 until her retirement in 1998. She retired a Chief Master Sergeant. Commander Boland has served a variety of positions throughout the last twenty-four years at the post, district and department levels. At the post level, she served as Historian, Finance Officer, Adjutant, 1st Vice Commander and Commander. She won the honor of being selected “Legionnaire of the Year 1998”. At the district level, she served as Scholarship Fund Chairman, DMS Coordinator, Vice Commander and Commander. At the Department level, she served as Children and Youth Chairman, Membership Chairman, Americanism Chairman, and Special Olympics Chairman. She also served as 3rd, 2nd and 1st Vice Commander. She is a graduate of the Community College of the Air Force (AA), Air Transportation Management. Her theme as Department Commander is “Communication, Dedication and Education” and her fundraising project will be Child Welfare Foundation (CWF) and Final Salute Inc. CWF contributes to the physical, mental, emotional and spiritual welfare of children and youth by aiding progress in the field of child welfare through dissemination of knowledge about research, studies, surveys, projects, or by supporting programs and activities benefiting the welfare of children and youth. The mission of Final Salute Inc. is to provide homeless women Veterans with safe and suitable housing. Commander Boland is married to Dennis of Lehigh Acres and together they have 2 daughters, Jennifer and Cyndie, one son, Joel, and 6 grandchildren; Joey, Cameron, Grant, Reily, Jake and Cole. Dennis is very active with The American Legion on both the state and national levels and is currently National Executive Committeeman. All members of Dianne’s immediate family are members of The American Legion family and have been for many years. Commander Boland is dedicated to support the four pillars of The American Legion; Veterans Affairs and Rehabilitation, Americanism, Children & Youth and National Security. Her dedication extends to the well-being of all veterans; past, present and future. The American Legion, Department of Florida boasts over 106,000 veterans still serving their country and the State of Florida, and with 2 million-members at the National level, The American Legion is the Nations Largest Veterans Organization. The American Legion was founded in 1919 on the four pillars of a Strong National Security, Veterans Affairs, Americanism and Youth Programs.